By Irina: Corporate Event Entertainment: Where Event Planning Companies Get Their Event Entertainment Ideas? Corporate Event Entertainment: Where Event Planning Companies Get Their Event Entertainment Ideas? If you are in party planning, you should know that Event Solutions magazine is on the desk of every self-respecting event planner. Can you imagine my delight, when this fab mag, ran an incredible two page profile on me this month? You can CLICK HERE to read this beautifully-crafted full-spread feature story, that makes me an official corporate entertainer worthy of her salt! It has been three years since I switched my career to a full time balloon artist, event entertainer. To tell you the truth, I had many career reincarnations. My last official employment was in public relations. Once I fell in love with balloon art, it took me three years to graduate from birthday parties and bar-mitzvahs to a well-regarded corporate event entertainer. 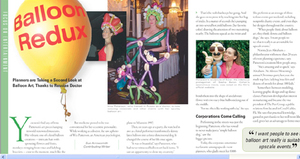 Known as The Russian Queen of Balloons, I entertain by twisting balloon art at high-end events nationwide. One thing that was going for me is my marketing and PR background. I understand corporate event goals, be it a party for VIP clients, a special employee appreciation event or a trade show and lead generation event. I vary my entertainment in each case to achieve maximum results for my clients. You can read all about it in Event Solutions magazine's article here.. and, if you are in party planning and want to stay on top of hot news in corporate event production, run not walk to get their FREE DIGITAL subscription Here.